Nearly 1000 people turn out for the Mondulkiri Wildlife and Us Celebration: a huge success for the local people and the local wildlife! 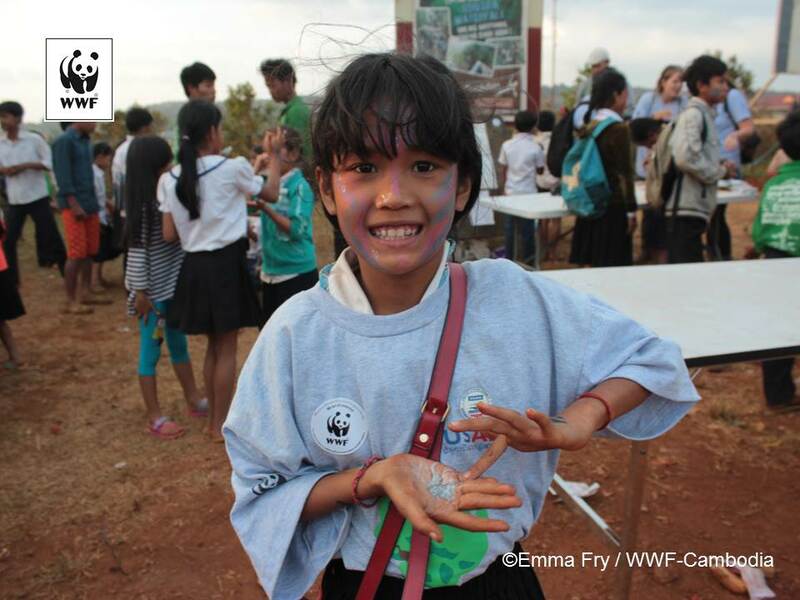 On Thursday 17th December, WWF-Cambodia held an event called “Mondulkiri Wildlife and Us” which aimed to celebrate and raise awareness about the many rare and endangered species of wildlife living in the Eastern Plains Landscape, where Mondulkiri Province is situated. The event also hoped to highlight the importance of protecting the wildlife and the habitats in which they live, to ensure their survival for future generations. The celebration was kindly funded by USAID and implemented by Winrock International, and was a huge success. Organisers were hoping to attract around 500 people, with seats being prepared in the beautiful tent ahead of time. The number of residents, local officials, school children and NGO representatives far surpassed this number, with initial estimates putting the figure of attendees between 750 and 1000 individuals; an amazing turn out for such an event. Every seat in the house was filled, with additional people choosing to sit on the floor or take pictures from the roadside just to get a glimpse of the day’s events. The atmosphere was alive with curiosity and excitement, with people incredibly keen to learn about the animals in their region and take part in the events. 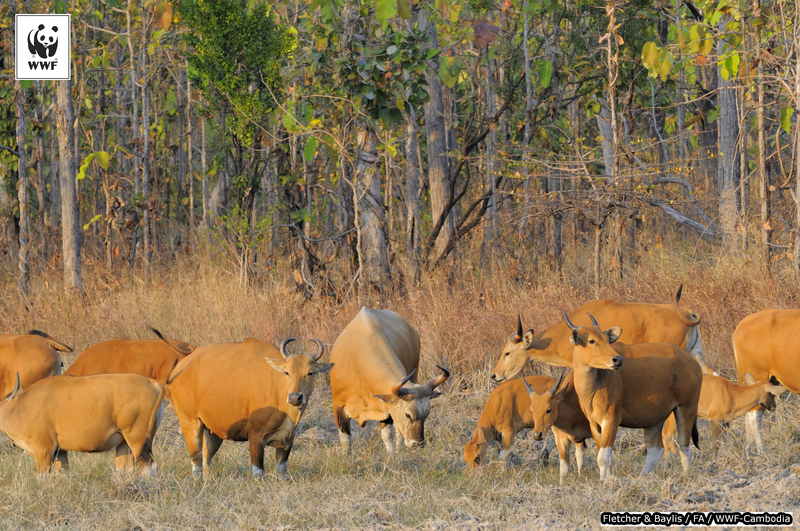 The Eastern Plains Landscape is an area of great importance to wildlife and local communities, in Cambodia and globally. The region is home to 18 Endangered and Critically-Endangered species of mammals, reptiles and birds, including the world’s largest population of Banteng and Yellow-cheeked-crested Gibbon, as well as a significant meta-population of Endangered Asian elephants. These elephants are of cultural importance, but due to habitat loss and demand for ivory, the population is under serious threat of extinction. It is vital that national and international organisations assist local communities to conserve the forests in this landscape and protect the wildlife that inhabits them. Dim Chan Thea, a mother who has been living in the province for the last 3 years, explained why she felt the event was so important, “When someone cuts down a tree or trades the nature, it will affect the nature – it means less rain or hotter temperatures! The wildlife and environment are all linked. I am proud because of the wildlife we have in Cambodia, to show to the world that we have amazing wildlife. It is also very important to teach all the children about the wildlife.” She had brought her young daughter along to help teach her about the importance of protecting the wildlife. The event was also kindly supported by the help of the partners and donors, WWF-Cambodia, Wildlife Conservation Society, Elephant Livelihood Initiative Environment, the Critical Ecosystem Partnership Fund, Mayura Hills, and the Cambodia Vulture Conservation Project. They all helped to make the day the great success that it was, providing educational material, prizes for the children’s competitions and activities throughout the day. The children from the local school put on a wonderful play about the importance of wildlife, with songs and dancing, and had the whole audience captivated with their messages. Each one of the children had a huge smile on their face, and you could tell they were happy to be part of such a big event in the town. There were also performances from the Bunong Art Group, as well as two finalists from this year’s Cambodian Idol – causing quite a frenzy amongst the teenage girls in the audience. So many people attended the event that many sat on the floor to enjoy the day. The children are proudly showing off their elephant entrance stamps. A local schoolgirl enjoying the face painting and art competition at the event.